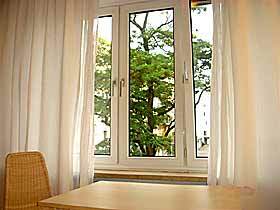 This holiday guest apartment is directly at Hohenzollernplatz in the lovely suburb of West-Schwabing. The subway, tram and bus, stop almost on the doorstep. 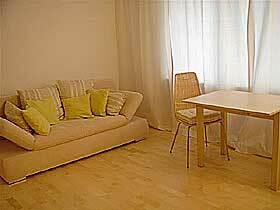 Numerous bars, restaurants, pubs, breakfast and internet cafés can be found in this area. Other nearby attractions include Luitpold park for relaxation and jogging (33 hectares, Bamberger House, small park manor, café-restaurant and the caricature gallery: "Cartoon-Caricatur-Contor"), the famous Nordbad for swimming (33m long pool, children’s pool, diving platform, outside pools with a flowing channel, lying area and gym in the cellar) or Hohenzollernplatz with fountains surrounded by quaint shops, Linden greenery and park benches for reading a good book in summer or wandering through the Christmas Market in winter. 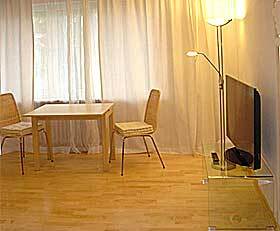 Small, non-smoking apartment (about 30 m²), modernly equipped and furnished with parquet flooring. It is in a multi-family house on the 1st floor without a lift. The apartment is very quiet and sunny. The tiled bathroom has a bath tub. 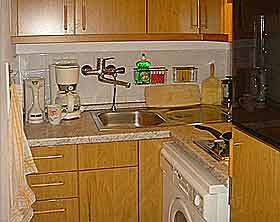 The kitchen has all the necessities for your stay, including a stove, fridge, coffee machine and crockery. The bed is a double sleeper couch (150 x 200cm). An extra double mattress can be supplied to provide a separate sleeping place. 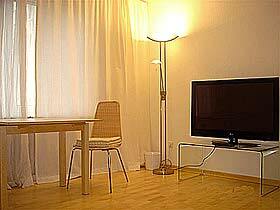 The apartment also has a washing machine and a flatscreen TV. During the Oktoberfest, 4 guests can stay over, although the space becomes very limited. Pets are not allowed. Breakfast is not offered, but there is a wide range of breakfast cafés and bakeries right on the doorstep. Children up to 3 years of age can stay free of charge in the parent`s bed or in their own bed (which you need to bring). A garage can be rented if requested for 10€ per night. Parking on the street comes with a charge, or you can leave your car at one of the park and ride`s outside of the city centre. The area inside the middle ring (city circle) of Munich is part of the LEZ. If you want to drive with your car in the Munich city centre and you do not have a sticker for the LEZ of Munich city centre, you can find information here, on how to get LEZ stickers for tourists. The host speak English, Spanish, and some French and she likes to give tips of the surroundings. Every 7th night is free of charge. Longer stays are possible. Garage: 10 euros per night. 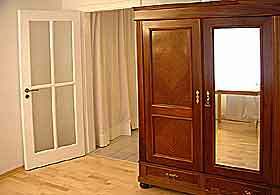 The apartment is located on Herzogstr. in 80796 Munich, Germany. 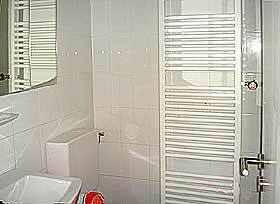 This apartment is made available by Privatzimmer Sens, Agency for holiday apartments and guest rooms in Germany.